Multi-bidding, not to be confused with header bidding, significantly increases publisher display ad revenue and overall earnings potential, typically boosting revenue a whopping 20-80%+ per tag placement. While multi-bid shares certain benefits with header bidding, the applications for multi-bidding are very different and present exciting new revenue opportunities for publishers. 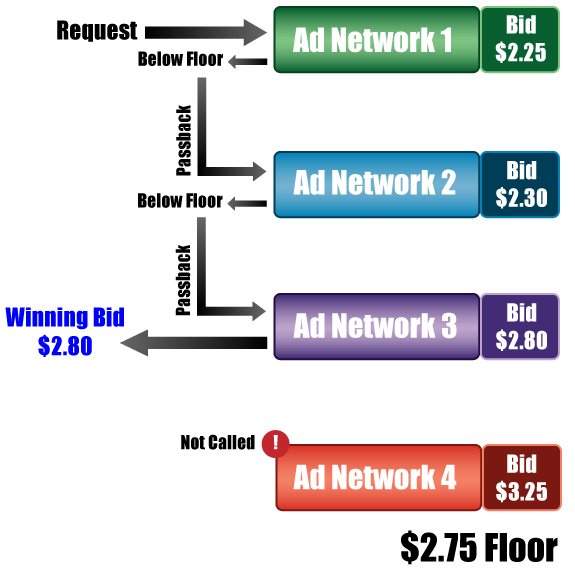 Like header bidding, multi-bid ad tags simultaneously bid out each impression request to multiple ad networks - in attempt to sell the impression for the highest price possible (the ad network or ad exchange returning the highest bid wins). But unlike header bidding, multi-bid ad tags are less obtrusive to page load as they don't execute in the site's header area. This significantly mitigates issues with page-load latency, and opens the door for publishers to quickly setup fast and competitive real-time auctions that leverage dozens of demand sources. Before we can dive deeper into multi-bidding, it is helpful to take a step back and understand the flaws and points of revenue leakage associated with the traditional ad passback waterfall model, and how header bidding fits into the whole picture. Saavy publishers with a thorough understanding of header bidding may want to skip ahead on to the last few sections. A demand chain can be described as advertiser demand components which have been setup or arranged in a manner so that they run or execute one-after-another in a series. Each demand component within the series (also known as passback waterfall) has a different priority which depends on that component's placement position within the tag chain. In a passback waterfall, the topmost or top-of-stack demand component has the highest priority, as it gives the lead ad network the first look at each request along with the first choice to either buy or pass on any given impression request, even before any other network has had an opportunity to bid. For simplicity, a base floor of $2.75 has been applied to each of the ad network tags included in the demand chain shown above. Ad Network 1 is the first network to see the impression request, and returns a bid of $2.25 CPM. Because the $2.25 bid is below the $2.75 floor, Ad Network 1 passes the request to Ad Network 2 (and the ad code for Ad Network 2 is known as the passback tag for Ad Network 1). Ad Network 2 then receives the impression request and returns a CPM bid of $2.30, which is still below the $2.75 floor, so again the request is passed on to the next ad network in the chain. Now Ad Network 3 bids $2.80 and wins, because it bid a price of $2.80, which is larger than the $2.75 floor. Ad Network 4 (and any remaining networks in the demand chain) never even had a chance to bid. And because Ad Network 4 would have paid a $3.25 CPM (far more than the winning bid of $2.80), this emphasizes one of the major issues with the passback waterfall model. One tactic publishers use to increase passback waterfall revenue is simultaneously setting aggressive tag floors, reducing the pricing gaps between tag floors, while increasing the number of overall partner components (or ad tags) included within each passback waterfall demand chain. While increasing the number of tag components within a demand chain drastically increases the overall CPM, when this happens overall fill rates tend to take a significant hit due to passback leakage. Passback leakage is the second major issue with the passback waterfall model, and results from the actual act of passing requests between ad networks. More technically speaking, passback leakage is the percentage of lost impression requests that go missing (or disappear altogether) when an ad network passes their unfilled requests back over to another ad network (i.e., passback leakage has a chance of occurring every time a request is passed from one tag to the next in a waterfall chain). This passback leakage increases with the number of passback ad tags used within any given waterfall demand chain, and can be as high as 10% request leakage per passback when passing from one demand source to another within a particular waterfall demand chain. Before the arrival of header bidding, Google's Ad Exchange (Google AdX) had established a sustained dominance as the only ad demand source permitted to bid against line items within Google DFP (DoubleClick for Publishers), which is now the most popular ad server with publishers. In other words, third-party networks and exchanges were not permitted to participate in the top-of-stack bid where Google AdX bids against DFP's ad serving line items. Header bidding changed all that by leveling the playing field across demand sources to facilitate true competition across all bidders, resulting in extreme financial benefits for adopting publishers. The image above represents how header bidding works. Here a floor of $2.75 has been implemented. First, a request-for-bid is simultaneously sent out to each of the four third-party ad networks displayed. When all bids have returned, or when the bid timeout has lapsed (whichever occurs first), the highest bid returned would win (assuming Google AdX opted not to beat the highest bid). Header bidding comes with both its advantages and disadvantages. The most significant advantages with header bidding are that it enables publishers to bid third-party demand directly against Google AdX within Google DFP. Google AdX and DFP aside, header bidding also enables true bid competition among demand partners which increases page RPM while eliminating waterfall passback leakage, resulting in significant increases in overall publisher ad revenue. Though header bidding requires developer(s) for integration and typically also for maintenance, the greatest disadvantage with header bidding is the page load latency that inherently comes along with it. Because header bidding occurs within a web site's header, a page using header bidding is delayed for some time waiting for bids to return before it can continue on to render. As result of these page load latencies, a number of publishers have either abandoned header bidding altogether or severely limited the capabilities of their header bidding implementation (reduced the number of ad network partners). More sophisticated header bidding implementations are being explored, such as those involving server-to-server communication. In any case, page load latency is bad. Mulit-bid is an entirely different animal. Like header bidding, multi-bid enables simultaneous bidding from multiple partners. Unlike header bidding, multi-bid has minimized the impact on page load performance, it has the unique ability of being leveraged at any point or position within any given passback waterfall, and it can passback to a default third-party or DFP tag when no bids are returned. Multi-bid is also plug-and-play for publishers, meaning no development work is required to integrate, update or maintain a publisher's multi-bid ad implementation or demand configurations. A multi-bid auction consisting of twenty-plus (20+) demand sources all bidding simultaneously is shown above. With multi-bid the best price wins and, with so many demand partners bidding, it's easy to see the revenue benefit of arranging these demand sources to truly compete. 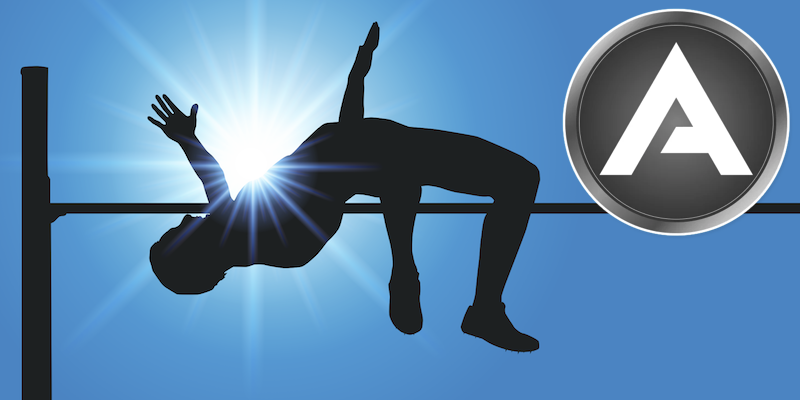 Broadening the bid landscape this widely ensures optimal revenue from publisher inventory. Another serious advantage with multi-bidding is how it addresses a publisher's process of building and nurturing each of their demand components. We all know finding and nurturing good partnerships takes time. And we understand that in optimizing, our demand configurations must constantly evolve. Multi-bid lets publishers and ad operations easily update demand configurations without involving technical resources or personnel. This empowers publishers of all sizes with the ability to rapidly deploy, nurture and expand their multi-bid demand configurations. To learn more about multi-bid, or to arrange for a test or case study, please contact multibid@adosia.com. *html tags are not allowed.